Stainless Steel banding is widely used for insulation securement within the oil and gas sector. Often used to secure product like cellular glass (Foamglass) or mineral wool (Rockwool) prior to sealing these products with metal jacketing. Once these products are held in place, the jacketing needs to be secure but often screws, rivets and other fixing methods are not appropriate due to potential damage of the insulation. This is where stainless steel banding excels its strong, resistant to corrosion and easy to secure using a banding tool and stainless steel wing seals or closed seals. 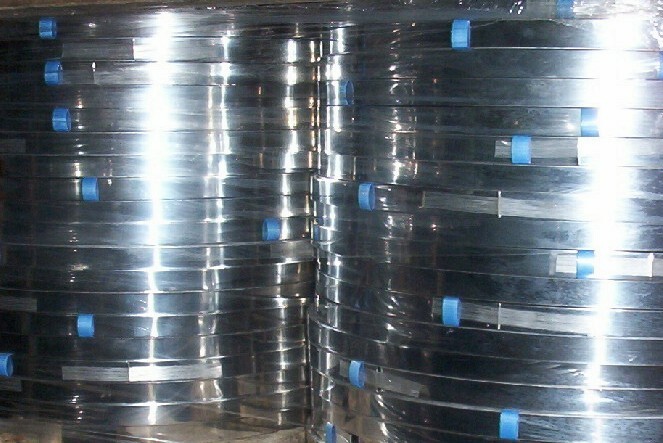 BS Stainless supplies stainless steel banding in grades 304 and 316 for the insulation industry and also 201 grade which is mainly used for sign fixing. Material can be supplied as a matt finish (2B) or a bright finish (BA) or even painted a popular colour being blue for identi­fica­tion of asbestos. The standards required for different markets vary some require small 30 metre (100 ft) coils others require large oscillated coils. For safety more markets are demanding a safe edge, this is manufactured by removing the burr from both sides of the banding then often packed individually in boxes. BS Stainless is probably the largest independent producer of stainless steel banding in the world, shipping to over 32 countries worldwide. Many projects are now specifying BS Stainless banding for quality and reliability. Other products work alongside banding typically expansion springs, mighty springs, tying wire and a range of other fixings like toggles , screws and rivets. BS Stainless produces these products and can send mixed loads worldwide from the head office in Preston, United Kingdom.